Directed by Denis Villeneuve. Produced by Basil Iwanyk, Thad Luckinbill, Edward McDonnell, and Molly Smith. Written by Taylor Sheridan. Release date: September 17, 2015 (limited); October 2, 2015 (wide). In the movies, it's far too often the case that black and white are the only shades with which the world is viewed. The good guys and villains are pointed out to us with great clarity, and we never for a moment begin to question their roles. We root for the hero, hope for the defeat of the antagonist, and that's that. 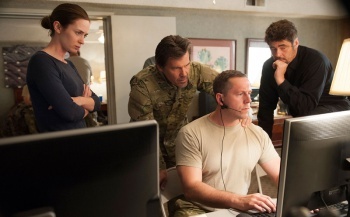 So, when a movie like Sicario comes around, which deals with a very real-world issue, it stands out by dealing in shades of gray. After all, real life more often than not isn't so clear-cut. The aforementioned real-life issue is the war on drugs. Emily Blunt stars as Kate Macer, an idealistic and perhaps naive FBI agent who is recruited to join a group focused on taking down a Mexican drug lord. Instead of only finding dead bodies, which was all she was doing before, she believes that she'll be able to prevent them by becoming a part of this team. However, under the leadership of Matt (Josh Brolin) and Alejandro (Benicio del Toro), she soon learns that there's a lot more to this war than meets the eye. It might not be exactly surprising to many members of the audience that both sides of the war do some decidedly shady things in an attempt to gain an advantage, but it's not something that we get to see in the movies all that often. 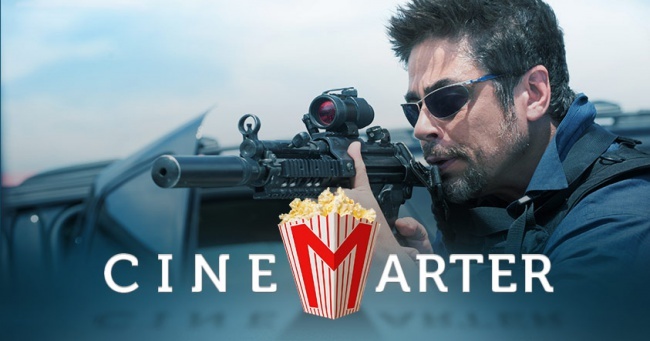 Sicario shows it in full view, dropping someone ignorant of all the goings-on - an audience surrogate character - and placing her front-and-center, bearing witness to all of the "controversial" steps that are taken by the government along the way. It's shocking not because of what happens, but because we get to see it - and thanks to the reactions of Emily Blunt, who cannot believe the atrocities placed before her eyes. In addition, we've also got a minor, but effective, story of revenge going on, although to detail exactly who or why would constitute spoilers. The tale about the war on drugs would be enough, but throwing this in - particularly at the end - generates even more shocks. One of the last scenes in the movie will leave you wide-eyed, unable to believe that we went there.